(Francisco Kjolseth | The Salt Lake Tribune) Gov. 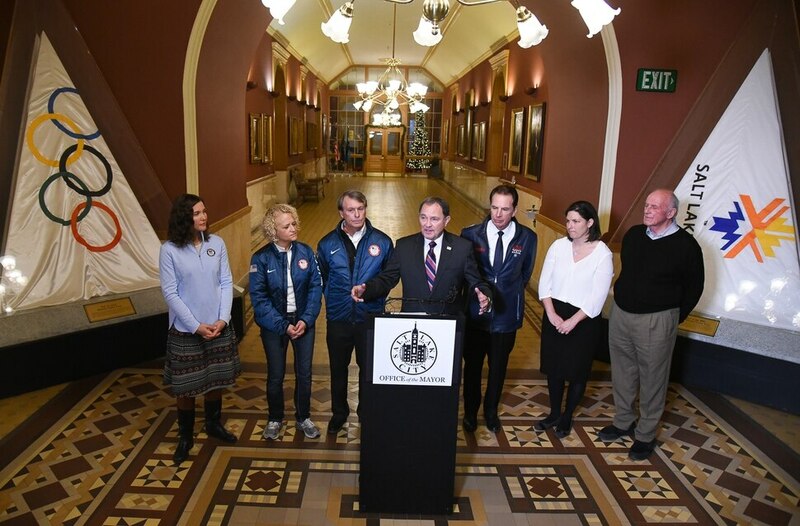 Gary Herbert, center, joins other Salt Lake City officials as they speak with the press after getting the news that U.S. Olympics Committee chose Salt Lake City over Denver to bid for a future Winter Olympics, possibly 2030, at City Hall on Friday, Dec. 14, 2018. (Francisco Kjolseth | The Salt Lake Tribune) Mayor Jackie Biskupski celebrates with other Salt Lake City officials after getting the news that U.S. Olympics Committee chose Salt Lake City over Denver to bid for a future Winter Olympics, possibly 2030, as they gather at City Hall on Friday, Dec. 14, 2018, following the decision. (Francisco Kjolseth | The Salt Lake Tribune) Former Salt Lake Organizing Committee chief operating officer Fraser Bullock joins Salt Lake City officials to celebrate after getting the news that U.S. Olympics Committee chose Salt Lake City over Denver to bid for a future Winter Olympics, possibly 2030, as they gather at City Hall on Friday, Dec. 14, 2018 to announce the decision. (Francisco Kjolseth | The Salt Lake Tribune) Salt Lake Mayor Jackie Biskupski joins other Salt Lake City officials celebrating after getting the news that U.S. Olympics Committee chose Salt Lake City over Denver to bid for a future Winter Olympics, possibly 2030, as they gather at City Hall on Friday, Dec. 14, 2018 to announce the decision. (Francisco Kjolseth | The Salt Lake Tribune) Salt Lake City officials gather to celebrate after getting the news that U.S. Olympics Committee chose Salt Lake City over Denver to bid for a future Winter Olympics, possibly 2030, as they gather at City Hall on Friday, Dec. 14, 2018 to announce the decision. (Francisco Kjolseth | The Salt Lake Tribune) Salt Lake City officials get ready to announce the news that U.S. Olympics Committee chose Salt Lake City over Denver to bid for a future Winter Olympics, possibly 2030, as they gather at City Hall on Friday, Dec. 14, 2018 to announce the decision. (Francisco Kjolseth | The Salt Lake Tribune) Former Salt Lake Organizing Committee chief operating officer Fraser Bullock discusses the news that U.S. Olympics Committee chose Salt Lake City over Denver to bid for a future Winter Olympics, possibly 2030, as they gather at City Hall on Friday, Dec. 14, 2018 following the decision. (Francisco Kjolseth | The Salt Lake Tribune) Salt Lake City officials celebrate after getting the news that U.S. Olympics Committee chose Salt Lake City over Denver to bid for a future Winter Olympics, possibly 2030, as they gather at City Hall on Friday, Dec. 14, 2018 to announce the decision. Raising their arms in celebration are councilman Erin Mendenhall, former Salt Lake Organizing Committee chief operating officer Fraser Bullock, Utah Sports Commission CEO Jeff Robbins, Mayor Jackie Biskupski, Gov. Gary Herbert, speed skater Catherine Raney Norman and councilman Jim Bradley, from left. (Francisco Kjolseth | The Salt Lake Tribune) Salt Lake City officials celebrate after getting the news that U.S. Olympics Committee chose Salt Lake City over Denver to bid for a future Winter Olympics, possibly 2030, as they gather at City Hall on Friday, Dec. 14, 2018 to announce the decision. (Francisco Kjolseth | The Salt Lake Tribune) Utah Sports Commission CEO Jeff Robbins discusses the announcement after Salt Lake City officials get the news that U.S. Olympics Committee chose Salt Lake City over Denver to bid for a future Winter Olympics, possibly 2030, as they gather at City Hall to share the news on Friday, Dec. 14, 2018. The phone call they long dreamt of finally came. Then they heard the words they hoped to hear all along. What followed was one very loud cheer, one that rang throughout the third floor of the Salt Lake City and County Building on Friday. The news was this: Salt Lake City is the nation’s choice. Again. 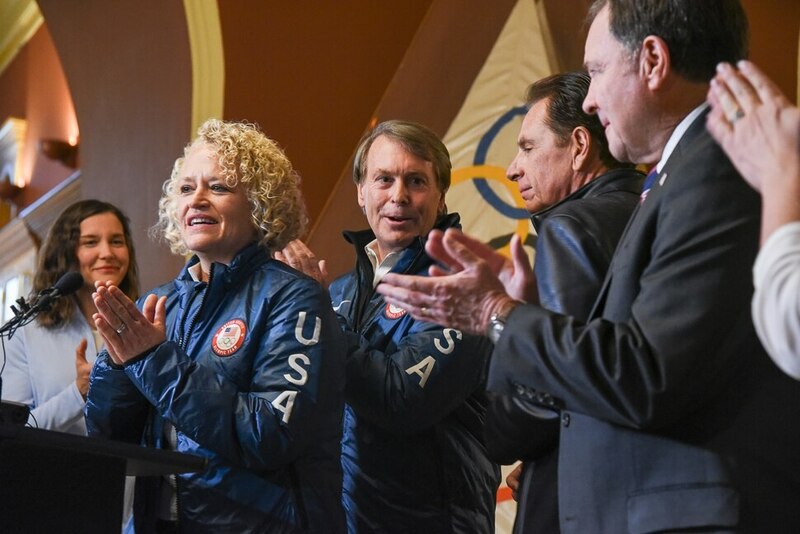 Shortly after, Olympic organizing veterans and elected officials emerged from the office of Salt Lake City Mayor Jackie Biskupski, locked hands and raised them skyward. “We won,” exclaimed Utah Gov. Gary Herbert. (Francisco Kjolseth | Tribune file photo) Thousands of fans and athletes celebrate the end of the 2002 Salt Lake Olympics at the dazzling Closing Ceremony at Rice-Eccles Stadium. (Trent Nelson | Tribune file photo) Swiss ski jumper Sylvain Freiholz, placed 27th in the qualification round of the K120 Ski Jump during the 2002 Winter Games at the Utah Olympic Park in Park City. 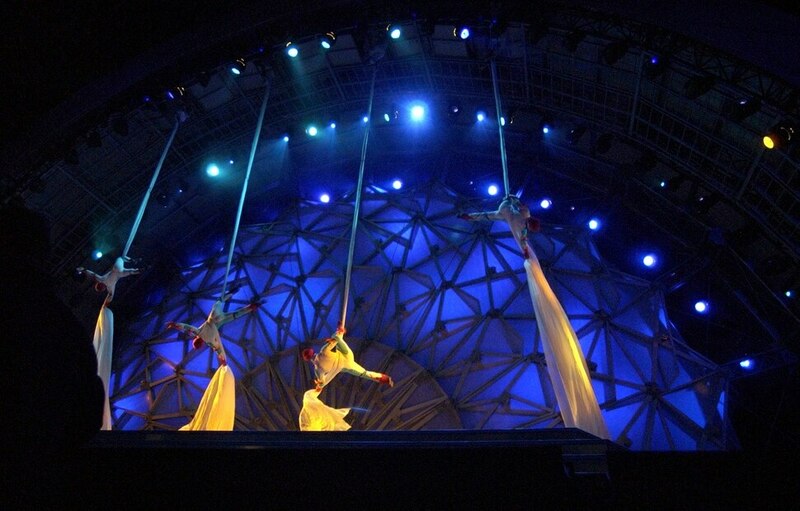 (Steve Griffin | Tribune file photo) Acrobats slide down long pieces of material onto the stage at the Olympic Medals Plaza during kicking off the first night of activities in downtown Salt Lake City Feb. 9, 2002. The first medalists of the 2002 Olympics received their medals and the Dave Mathews Band performed. (Danny La | Tribune file photo) The colorful suit of South Korea's Sang-Yeop Yeo blurs by in a turn Men's 1500 meter Speed Skating at the Utah Olympic Oval in Kearns, Utah during the 2002 Winter Games. (Steve Griffin | Tribune file photo) A ski jumper sails through the air during the finals of the K120 ski jumping at the Utah Olympic Park in Park City during the 2002 Winter Games. (Trent Nelson | The Salt Lake Tribune) American Todd Lodwick flies over the Olympic rings in the final round of the Nordic Combined K90 ski jump, 2002 Olympic Winter Games. Lodwick placed seventh in today's competition. (Francisco Kjolseth | Tribune file photo) Fireworks explode above the Closing Ceremony at Rice-Eccles Stadium, signaling the end of the Salt Lake Olympics. (Rick Egan | Tribune file photo) Thousands of fans reveled while fireworks exploded above the City and County Building in 2002 to welcome the Olympic torch relay to Salt Lake City, while giant portraits of athletes graced the sides of downtown buildings and helped create a festive atmosphere. (Grayson West | Tribune file photo) The German team of Andre Lange takes their third run of the four-man bobsled at the Utah Olympic Park during the 2002 Games. Team Germany won the gold medal. (Paul Fraughton | Tribune file photo) Fans mob moguls skier Jonny Moseley at the 2002 Salt Lake Olympics. (Trent Nelson | Tribune file photo) USA gold medalists Jill Bakken (front) and Vonetta Flowers celebrate their track record first run during the 2002 Olympic Winter Games at the Utah Olympic Park in Park City. (Danny La | Tribune file photo) Men's Speed Skating at the E Center in Kearns, Utah, during the 2002 Winter Games. (Danny La | Tribune file photo) The 1980 USA Olympic Hockey Team lights the Olympic Caldron at the Opening Ceremonies of the 2002 Salt Lake Winter Olympic Games. After a day-long board of directors meeting Friday, the USOC favored Salt Lake City, which hosted the 2002 Games, over fellow Rocky Mountain finalist, Denver. The USOC bid, which had been labeled a “future Olympic Winter Games" in the run-up to the decision, specified 2030 as a potential target. 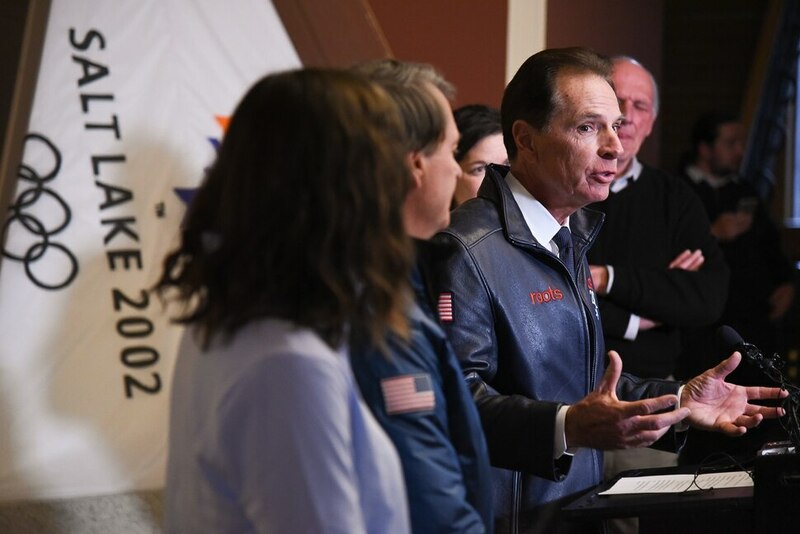 “The United States is committed to hosting Games that are both remarkable and practical, and we believe that Salt Lake City is the community most capable of delivering against that promise,” said USOC CEO Sarah Hirshland. The U.S. Olympic Committee doesn’t want to target the 2026 Winter Games, which the IOC will award this summer, as not to steal the thunder — and the sponsorship dollars — from Los Angeles. Incoming Utah Sen. Mitt Romney, who led the organizing committee for the 2002 Games, took to Twitter to celebrate a 2030 bid. “Utah is ready, willing and more than able to once again host the world,” he wrote. The Olympic community worldwide still holds Salt Lake City’s 2002 Games in high regard. And since the Olympics left nearly two decades ago, Salt Lake City and Utah have capitalized on that legacy. Venues remained world-class and world-class events continually are held in Utah, including skiing, snowboarding, speedskating, bobsled, skeleton and luge World Cup events. Not to mention the World Championship events held here. More are returning in February. Which is why a desire for a sequel has always loomed. And it’s why state and local officials have been positioning themselves for another run since 2012 when Gov. Gary Herbert first announced publicly that Salt Lake City would be willing to welcome the world to the Wasatch Front and surrounding communities once more. At the conclusion of the 2002 Games, $76 million was set aside to create a legacy endowment, to fuel further growth once the Olympic flame was extinguished over 16 years ago. Last year, the state created the Olympic Exploratory Committee, with familiar faces who helped steer the 2002 Games, including former Salt Lake Organizing Committee chief operating officer Fraser Bullock and Utah Sports Commission CEO Jeff Robbins. Soon enough, Biskupski and former Utah Senate President Wayne Niederhauser got on board. The coordinated effort of Salt Lake Olympic officials gave them a leg up on all other domestic competition. “What we put forward to [the USOC] clearly demonstrated we were the right city to host a future Games,” Robbins said. Last year, before the 2018 Olympic Games in Pyeongchang, South Korea, Utah’s exploratory committee started making headway by outlining what another Olympics would look like, how much it would cost, and how much money would be needed to maintain the existing Olympic infrastructures already in place. A detailed audit showed that the existing venues needed about $40 million in upgrades to get to another Olympic standard. Within months, the Utah Legislature provided the money to start the modernization. When the USOC visited for a day crammed with meetings and on-site visits at venues in mid-November, USOC officials were impressed by the local support. Enough to, within a month, choose Salt Lake City. The Olympic Exploratory Committee has vowed that no public funding or taxpayer money will be needed during this bid process. It will be entirely privately funded, including the IOC bid process. The budget anticipated for a 2030 Games is $1.4 billion in today’s dollars, probably $1.7 billion by the time the cauldron is lit. Bullock recently told The Salt Lake Tribune that an Olympic return to Salt Lake City can be self-sustaining for several reasons: The IOC awards $650 million to a future selection and it’s anticipated that $300 million will come from ticketing, that’s nearly $1 billion without factoring in merchandising and domestic sponsorships. Gov. Herbert reiterated Friday that the private sector will play “a significant part” of this effort to bring the Games back to Utah. “We have support and we will find solutions,” Herbert said. Biskupski and other officials pointed out Friday that these potential Olympics will be much different than 2002, for obvious reasons. The state’s population has boomed in the years since, with more infrastructure in place like public transit and venue expansions like Vivint Smart Home Arena and the impending expansion at Rice-Eccles Stadium, plus the ongoing remodel at Salt Lake City International Airport, which is scheduled to be done long before 2030. She even mentioned the idea of exploring new ways to host events, saying preliminary discussions have been held regarding hosting outdoor Olympic hockey events, pointing to Rio Tinto Stadium, built in Sandy in 2008, as a potential new venue. Friday’s decision was just the first win of what Utah Olympic officials believe can be another sustainable, marketable Olympics in a region of the world that still supports the Games at a fervent clip. No U.S. market saw higher TV rating during the 2018 Olympics than Salt Lake City. What’s next, however, comes more planning, more logistical work, and as Bullock pointed out, it’s the USOC’s path now. “They’re the lead and we follow their lead,” he said. With the 2030 Games being so far off, there are no other clear frontrunners worldwide. Sapporo, Japan, has expressed some interest after dropping out of the 2026 campaign process. But right now, it’s all Salt Lake City. That, of course, will change after the 2026 Games are awarded this summer. The two finalists right now are Milan, Italy, and Stockholm, Sweden. Bullock said the bid process ramps up intensely typically two years before the bid is awarded, so with 2030 being chosen in 2023, there’s still some time. “The campaign actually starts now in a low-key way," he added. In their decision-making process, the USOC said it conducted its own independent poll to gauge the interest of Utah residents. Robbins said while the USOC did not initially specify the numbers in its independent poll on the congratulatory call Friday, officials singled out how supportive Utah’s Olympic community was regarding another potential Games. Biskupski tweeted late Friday night that the USOC poll featured 82 percent of Utahns in support of another Games. The state had, in fact, spoken. So, too, has the USOC. Sipping on a glass of celebratory grape juice in front of two encased Olympic flags that flew in the 2002 Games, Robbins described the moment USOC chairman Larry Probst informed the group that Salt Lake City was indeed the pick.